Give your tough chewer a challenge with the KONG Extreme Dog Toy. 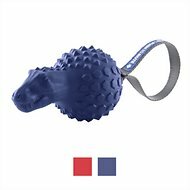 This plaything is made from the toughest all-natural black rubber to stand up to whatever your pup can throw at it. This durable toy also features an erratic bounce your pup will love. Pet parents can even fill it with kibble, treats or peanut butter to add more excitement to playtime. 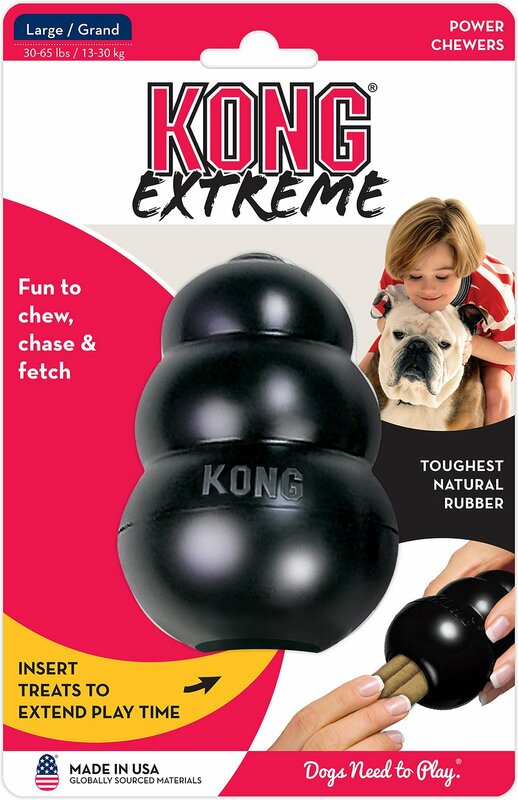 Whether your paw-tner loves a game of fetch or simply wants something to chew on, KONG Extreme Dog Toy will fulfill all of his needs and more. Designed with the toughest chewers in mind to withstand your pup. Made with an extremely durable, all-natural black rubber formula. Features an erratic bounce to keep your furry friend guessing. Great as a fetch or chew toy to keep your paw-tner occupied. Every dog plays differently and, since not all toys are created equal, it’s always best to keep a close watch on your pup in case things get ruff. Supervised play will help toys last longer and most importantly keep your pal safe. No dog toy is truly indestructible, so always remove the toy from playtime if pieces begin to break off. Power Chewers may need to size up one or two sizes. Make this toy extra fun with Stuff'N Treats. 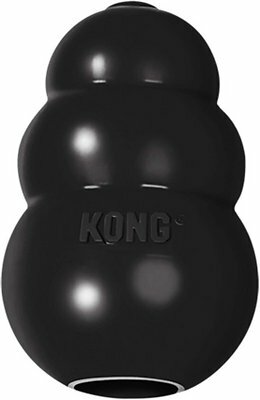 KONG toys have been enriching dogs for over 40 years, strengthening the bond between dog and pet parent along the way. KONG Extreme is made with KONG's most durable rubber strength and is ideal for power chewers. A dog's physical and mental development are influenced by a healthy, instinctual need to play. Built for durability, KONG dog toys encourage play and offer enrichment, meeting this natural need to play. 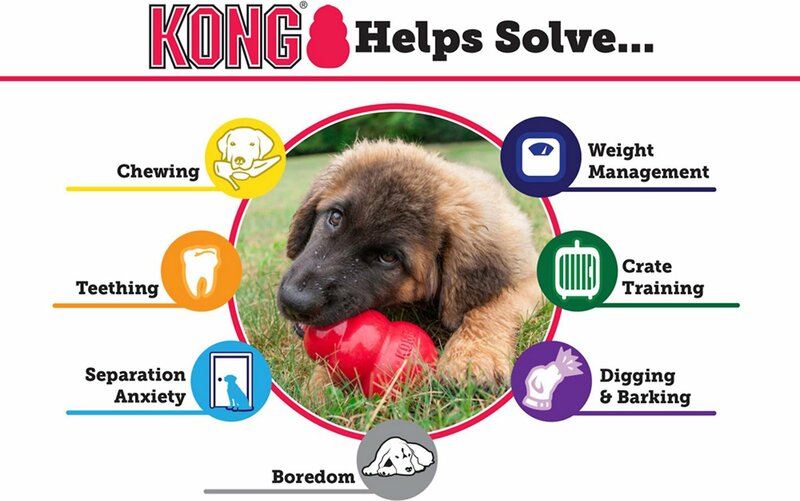 KONG encourages dogs to focus energy on healthy engagement, helping prevent unwanted behavior by providing a mentally stimulating, physical challenge that keeps dogs occupied and mentally challenged. Stuff: Stuff loosely for beginners or tighter for more advanced users (w/KONG Snacks or your dog's favorite kibble). Entice: Use a tasty appetizer such as KONG Easy Treat or peanut butter. Enrich: A stuffed KONG offers mental and physical enrichment. Extend: Want to extend playtime? Freeze for a longer-lasting challenge. Looking for more enrichment? Select a KONG Classic shape that is right for your dog. KONG dog toys encourage play, satisfying instinctual needs and strengthening the bond between dog and pet parent. Built for durability, KONG Dog Toys offer mental and physical stimulation, all while meeting a dog's need to play. All KONG Rubber Toys are proudly made in the USA with Globally Sourced Materials. Very disappointed! My 10 month old husky/pit chewed the top “ball” right off the second time it was used. It supposedly lasts longer than the other Kong’s but the blue puppy Kong somehow outlasted this “extreme” Kong, which she chewed on DAILY for 9 months. Sadly, I wouldn’t let her finish getting the peanut butter out of the rest of it before throwing it away. I’m definitely going back to filling her marrow bones up with PB even though it’s less exciting and time consuming. Most amazing toys on the market!!! I have a Jack Russell mix who can destroy almost ANY chewy toy, especially squeaky ones, in about 30 seconds!! Except for KONG brand toys!! He has about a dozen! They may be a bit more expensive, but my baby has some he’s had for 2 or 3 years and they even still squeak!!! It’s crazy!! And the only brand I buy any longer! All the others are a waste of money if you have an aggressive chewer like mine!! We have a HUGE chewer, a collie/Shepard mix, who can chew through literally anything- except this!! We have the tough bone and tough ball too and they are the only toys that he has not been able to chew apart and shred. He absolutely loves when we stuff treats in them, these will keep him busy for hours. The best part is he still will chew it even if there aren’t treats in it. We were happy with anything that lasted more than a few days in our house, but we’ve had these for a month and they’re still going strong! Highly highly recommend trying! This KONG delivered exactly what my pooch was hoping for--lots of play, engaging problem solving all while having fun. You will enjoy watching your dog work every angle to try and get the much desired treat out or simply fetch it after another unpredictable bounce. If you have a young/curious/energetic pet who needs extra stimulation to keep them out of trouble, look no further. My 45 lb rescue puppy has to keep his mouth busy like he's trying to quit smoking. He demolished this toy in about 15 minutes. In those 15 minutes, though, he was ECSTATIC. He loved this toy with all his heart, and that was why it had to die. I think Charlie-Dale's chewing is an extreme case, so I would still say this is worth getting. I ordered this KONG, and within just a few weeks, my EXTREME chewer (Doberman/Weimeraner) chewed the top off of it. I wasn't entirely surprised since my dog eats everything in sight, but was hopeful it would have last a bit longer. It is very durable, so I'm sure it would hold up better for other breeds. I contacted Chewy to see if anything could be done. The representative was friendly and immediately sent out a replacement for it. Let's hope the next one will last a bit longer! I appreciate how quickly and efficiently Chewy takes care of their customer's issues. Not for powerful chewers !!!!! My 70 lb German Shepherd managed to destroy this Kong (chewed the nub off the top) just 1 hour after I gave it to her. Seems stronger than the red ones, but still will not hold up to a really determined chewer. Not sure what to try next, maybe an actual truck tire - LOL ! This is a highly recommended and wonderful product. It’s extremely durable, it not only slows down your dogs eating rate, but makes your dog use his mind so they can get the food. Mental stimulation is extremely important, as is mental and physical exercise. The dog gets both. That was not my first or last. Must have many on hand because if you stuff them correctly and freeze them, you can give it to the dog in a crate or outside of the crate and it provides hours of fun and stimulation. My dog can destroy almost any toy within minutes. That’s why I chose the Kong extreme. Not only does she absolutely love this toy, but it withstands her tough chewing abilities. I love to fill it with treats and peanut butter so she has something to do while I’m gone for the day! She also loves to play fetch with it since it doubles as a great bouncy toy. This toy is surprisingly easy to clean as I am able to just throw it in the dishwasher. I would HIGHLY recommend this product!!! !